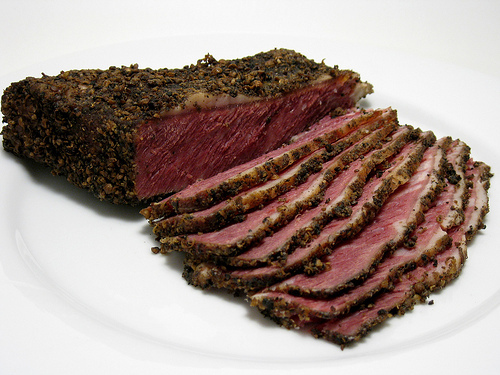 Although pastrami takes a lot of time to cook, it is one of the most delicious and nutritious dishes. Sliced up thinly, it can serve as a filler for numerous tasty sandwiches, or as an appetiser on its own. Although it is a deli staple, you can easily make it at home too, if you spare some time and effort. First of all, take a bowl and put some vegetable oil into it, along with the garlic. After mixing them, put them aside for around an hour. Meanwhile, preheat the oven to around 225 degrees Fahrenheit i.e. 110 degrees C.
Take a large bowl and mix the paprika, coriander, white pepper, black pepper and cayenne pepper in it. Put the bowl aside for a while. Then, take a baking sheet and cover it with some heavy-duty aluminium foil. After that, coat the aluminium foil with the garlic oil which you prepared in the first step. Now, place the corned beef brisket on the aluminium foil and brush it with the remaining oil. Before placing the corned beef brisket on the tray, it is extremely important for you to make sure that the aluminium foil is properly coated with the garlic oil, otherwise the beef will stick to the baking sheet. Take the pepper mixture and cover the beef brisket with it. Reserve around 1 to 2 tablespoons of the pepper mixture. Wrap the corned beef brisket in the aluminium foil while keeping the fat side up. Then, wrap the corned beef in another foil while keeping the fat side down. Then, place the double-wrapped corned beef in the third sheet by keeping the seam down and wrap it again. Place the baking sheet in the oven and bake for around six hours. Take the pastrami out of the oven and set it aside for around 3 hours. Then, place it in a plastic bag and put it in the refrigerator for around eight to ten hours. Now, preheat the broiler, keep the oven rack around six inches from the heat, and line another baking sheet with aluminium foil. Take the pastrami out of the refrigerator and place it on the prepared baking sheet. Put it in the oven after sprinkling on 2 tablespoons of the reserved pepper mixture. Take the pastrami out of the oven after three to four minutes. It can now be sliced up and served as per your preferences. What is a Burgundian Wine?